My fifty-sixth stadium of 2011 was on Tuesday 30th August 2011 at Chalk Lane in Cockfosters, London. 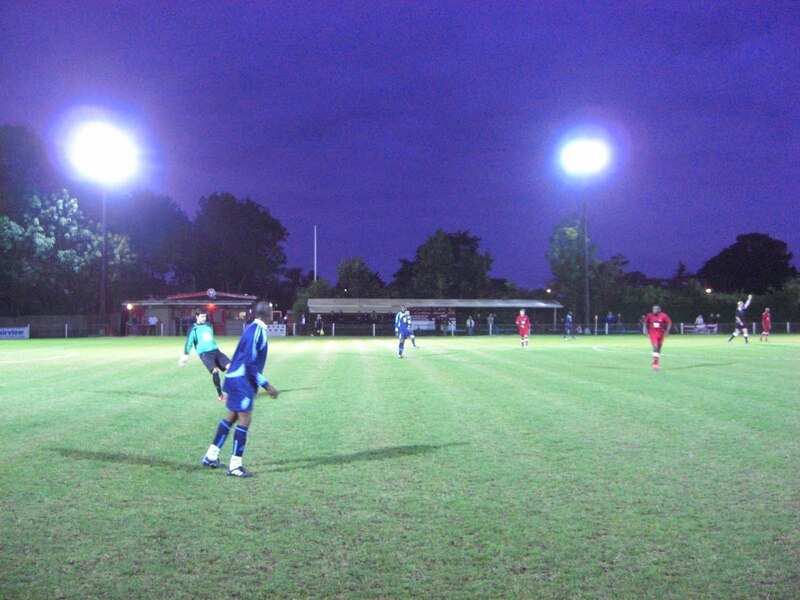 The match was Cockfosters vs. Kentish Town in the Molten Spartan South Midlands League Division One. Chalk Lane is just 400 yards from Cockfosters tube station on the Piccadilly Line. The ground has been home to Cockfosters since they were founded in 1921. Chalk Lane is a small venue that makes up a larger sports area which sits on the edge of a built-up residential area. The ground borders Cockfosters Cricket Club on its south side and Trent Park on its west side. As the stadium is hemmed in on all sides it is quite basic in nature and feels quite small. The west side of the ground houses all the facilities including a decent clubhouse. It also contains the main spectator area - a covered seating section mostly consisting of wooden benching with around 30 plastic seats next to this. The south and east sides of the ground is general standing behind the metal barrier that separates fans from the pitch. The team dugouts are also located on the east side of the venue. One issue the venue has is that the hedges on the north side of the ground encroach right up to the goal itself so there is no room for any people. However, for a small club like Cockfosters the space for spectating is more than adequate. The game turned out to be a formality for Cockfosters who were the better team all evening against a poor Kentish Town who had conceded eight in their previous fixture. The scoring was opened however in contentious circumstances after a Cockfosters forward collided with the keeper and the ball was tapped in. At higher levels the goal would certainly have been disallowed but it was allowed to stand here and from this point on the floodgates opened with the home side adding two more before the break. Like the first half the visitors started ok but collapsed towards the end conceding another three goals in the last 10 minutes to go down to a heavy 6-0 defeat.